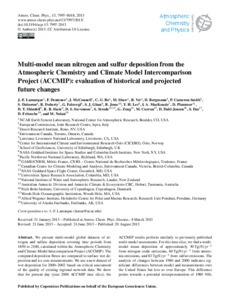 We present multi-model global datasets of nitrogen and sulfate deposition covering time periods from 1850 to 2100, calculated within the Atmospheric Chemistry and Climate Model Intercomparison Project (ACCMIP). The computed deposition fluxes are compared to surface wet deposition and ice core measurements. We use a new dataset of wet deposition for 2000�02 based on critical assessment of the quality of existing regional network data. We show that for present day (year 2000 ACCMIP time slice), the ACCMIP results perform similarly to previously published multi-model assessments. For this time slice, we find a multi-model mean deposition of approximately 50 Tg(N) yr−1 from nitrogen oxide emissions, 60 Tg(N) yr−1 from ammonia emissions, and 83 Tg(S) yr−1 from sulfur emissions. The analysis of changes between 1980 and 2000 indicates significant differences between model and measurements over the United States but less so over Europe. This difference points towards a potential misrepresentation of 1980 NH3 emissions over North America. Based on ice core records, the 1850 deposition fluxes agree well with Greenland ice cores, but the change between 1850 and 2000 seems to be overestimated in the Northern Hemisphere for both nitrogen and sulfur species. Using the Representative Concentration Pathways (RCPs) to define the projected climate and atmospheric chemistry related emissions and concentrations, we find large regional nitrogen deposition increases in 2100 in Latin America, Africa and parts of Asia under some of the scenarios considered. Increases in South Asia are especially large, and are seen in all scenarios, with 2100 values more than double their 2000 counterpart in some scenarios and reaching > 1300 mg(N) m−2 yr−1 averaged over regional to continental-scale regions in RCP 2.6 and 8.5, ~ 30�% larger than the values in any region currently (circa 2000). However, sulfur deposition rates in 2100 are in all regions lower than in 2000 in all the RCPs. The new ACCMIP multi-model deposition dataset provides state-of-the-science, consistent and evaluated time slice (spanning 1850�00) global gridded deposition fields for use in a wide range of climate and ecological studies.